Last Saturday the newest member of the AIDA fleet, AIDAperla, returned to its home port of Palma de Mallorca for the first time since the official naming and maiden voyage. Awaiting the arrival was a local Mallorcan delegation to welcome the ship back to its summer home, which is a favorite destination of German vacationers. Details appeared in the July 14 edition of Cruise News Daily. Last weekend Majestic Princess was named in Shanghai by international basketball superstars Yao Ming and Ye Li. The Royal-class ship will sail most of the year in the Chinese source market from Shanghai. The ship is Princess' first to feature customization for the Chinese market. Thanks to the success of this year's Meet the Winemaker cruises, Norwegian Cruise Line will be expanding them for the 2017/2018 Caribbean season aboard Norwegian Escape and Norwegian Dawn. Details appeared in the July 13 edition of Cruise News Daily. Seabourn is treating their passengers to some outstanding jazz performances this fall by two of the greats in the jazz world as their ships sail the Caribbean and transit the Panama Canal. 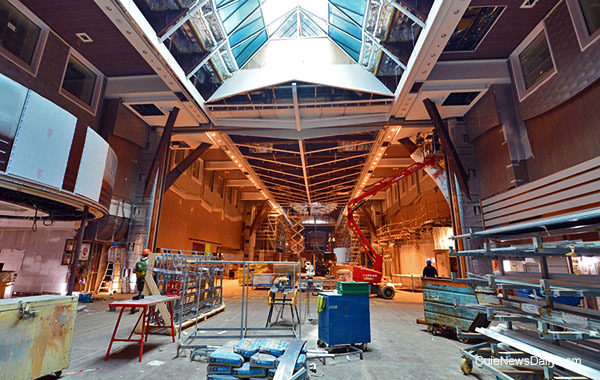 Royal Caribbean's Symphony of the Seas is really starting to take on some of the Royal Caribbean "look" in its interior now. A few weeks ago it looked very much like a house under construction where you could really only see the studs. The owner was excited about it, but it was hard to catch the vision. Now on Symphony you can begin to see the "rooms." 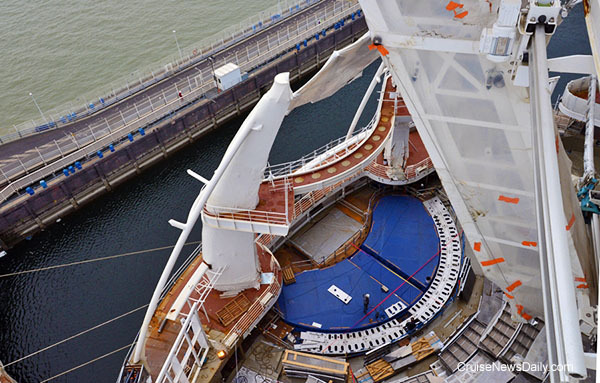 In these photos taken last week in the STX France yard in Saint Nazaire, you can now see the AquaTheater taking shape, and then looking forward into the 230,000-ton ship, it begins to look something like you expect a ship to. Delivery is still set for early next year. 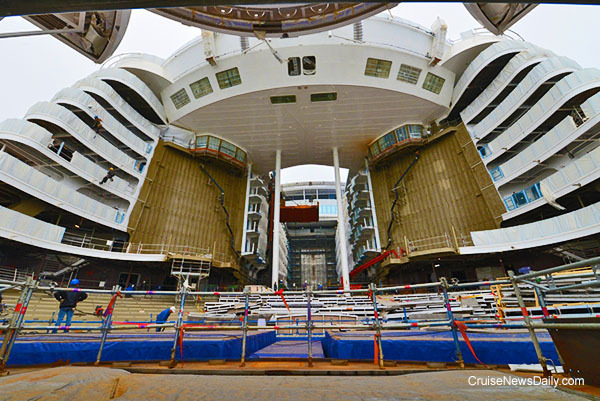 Photos courtesy of Royal Caribbean. All rights reserved. May not be copied or used without express permission. A key feature of Silversea's expedition cruises is knowledgeable and capable expedition team members to go ashore. As Silversea's expedition fleet expands, so does their need for those knowledgeable and capable expedition team members. Where do they find them? They don't grow on trees. Silversea will be recruiting them themselves and developing talents they already have in Silversea's Expedition Leadership Training Academy. The complete story appeared in the July 12 edition of Cruise News Daily. P&O's next ship needs a name - and it has to be a special name. The ship, which will be delivered in 2020, will be Britain's biggest ship - 180,000 tons and 5,200 lower berths. The complete story appeared in the July 11 edition of Cruise News Daily. Carnival Cruise Line Australia has discovered a trend down there called “Honeyboomers.” No, it has nothing to do with flatulence caused by eating too much honey. It's parents of older children getting away without their children and remembering why they fell in love. Carnival has seen an 80% increase in the last four years of Honeyboomers sailing in Australia, so they decided to look further into this phenomenon. Details appeared in the July 11 edition of Cruise News Daily. There are several ways cruise lines go to Cuba, and we've said before that we believe Norwegian has the right idea about how to do short cruises there. Others must agree because they have so much business, Norwegian is doubling capacity next summer with a second ship. Norwegian Sun will be sailing four-night cruises to Cuba weekly from Port Canaveral beginning next summer. Details appeared in the July 10 edition of Cruise News Daily. Apparently at the end of the Silk Road is ... a giant bottle of champagne (which beats a pot of gold, if you're thirsty). After a 49-day voyage from Rome, and 22 ports along the way, Majestic Princess arrived at Shanghai on Sunday ready to be officially named. 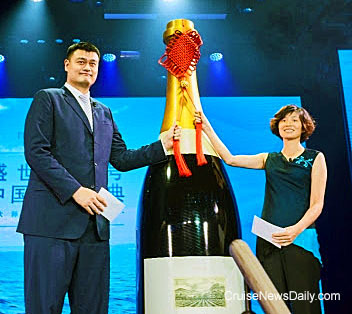 Standing right there next to the bottle were naming ambassadors (and international basketball stars) Yao Ming and his wife Ye Li. The complete story appeared in the July 10 edition of Cruise News Daily. Photo courtesy of Princess Cruises. All rights reserved. May not be copied or used without express permission.